Street corner tables have become mini gambing kiosks.. Following a decade of tradition the All-Armenian Fund will present "Telethon 2003" next Thursday (November 27, Thanksgiving Day in the US), offering viewers in several parts of the world a chance to make donations to projects that will benefit Armenia. Originating in Los Angeles, the five-hour program (12 hours in Los Angeles) will be hosted locally by actors Vardan Petrossyan and Hrant Tokhatyan. 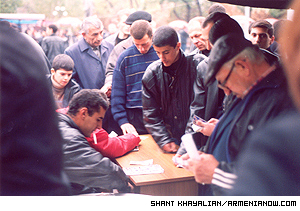 Started in 1993, over the years the telethon has raised some $81 million for projects in Armenia and Karabakh. Each year the fund has designated a special project to draw viewer attention. One year, funds from the telethon helped complete the road connecting Armenia and Karabakh. This year's fundraiser will serve a similar purpose, asking viewers to make pledges of money for finishing the North-South Highway in Karabakh. Executive director of the fund (former Minister of Foreign Affairs of Karabakh) Naira Melkumyan, says the road is of strategic significance for Karabakh. "This road is very important for Karabakh and we can't delay its construction any longer," says Melkumyan. "It's necessary to collect another $15 million and I hope that this issue will be solved in two years." While the Armenians in Los Angeles are preparing for their telethon, the council of the Fund in Europe already considers its November 13-16 telethon a success. For four days, 600 young Armenians from France were making phone calls to thousands of Armenian families in different European countries offering them a chance to pledge to the Fund. As a result, about 10,000 families from France, Germany, Netherlands, Switzerland and Portugal promised to send a total of 740 thousand (about $900,000) to the All Armenian Fund. According to board of trustees member Petros Terjyan the French telethon collected about 55,000 more than last year. "Each year the network of the telethon broadens. Only in France the number of participants has increased by a thousand," says Terjyan. "Today Diaspora are more aware of the problems in Armenia and Karabakh and they wish to contribute to the prosperity of their native country." During the years of its activity All Armenian Fund has built more than 100 schools, kindergartens, hospitals and apartment buildings. The main funds to carry out all this work were collected through telethons, using television, telephone and Internet. To find out the broadcast schedule for your country or how to make a donation, logon to www.himnadram.org.